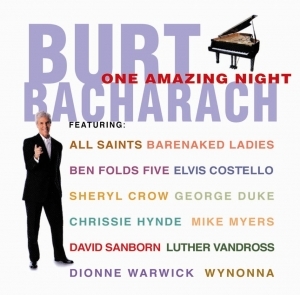 Burt Bacharach is, quite simply, one of the most accomplished composers of the 20th Century. In the '60s and '70s, Bacharach was a dominant figure in popular music, writing a remarkable 52 Top 40 hits. He is best known for his many pop hits from 1962-70, with lyrics written by Hal David, recorded by countless major artists, notably Dionne Warwick, who features in this line-up. As of 2006, Bacharach had written a total of 70 Top 40 hits in the U.S., and 52 Top 40 hits in the UK. Bacharach, the king of relaxed, suave melodies that have quietly assumed a sentimental position in our lives, is celebrated here by an illustrious group of performers who paid him tribute during the inaugural episode of TNT's Master Series. Sheryl Crow throws in the torch for a sultry "One Less Bell to Answer." Chrissie Hynde breaks past her leather-jacket toughness for a tender read of "Baby It's You" and "Message to Michael." Elvis Costello expertly performs his collaboration with Bacharach, the Grammy-awarded "God Give Me Strength" (from the Grace of My Heart soundtrack). Mike Myers camps up "What's New Pussycat?" But none can top the real thing. Dionne Warwick brings us back to the late '60s of Bacharach's prime with a riveting medley of "Walk On By/Say a Little Prayer/Do You Know the Way to San Jose." That and Bacharach's lush arranging skills make the title true to its word.